You are looking at what drives the FPB team, what our client (and we) have been waiting to see after 2.5 years of intense effort. 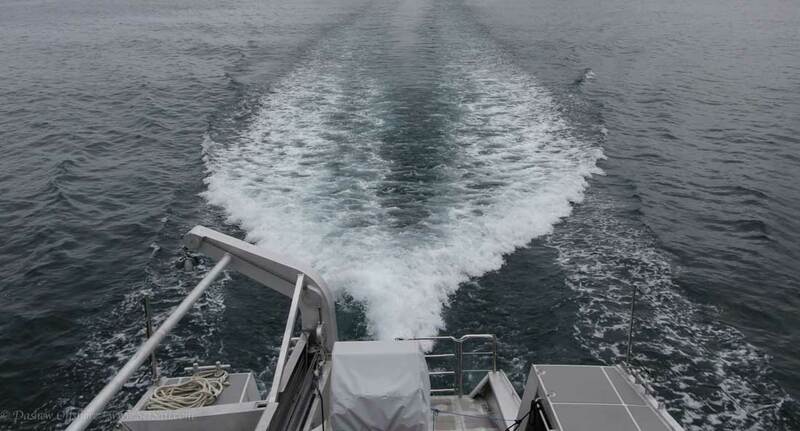 A lovely clean flow release off the stern with minimal magnitude indicating a highly efficient cruising machine (this at 13.1 knots GPS averaged in two directions). A wicked wake indeed. Compare today’s wake to yesterday’s at 12 knots. This one is obviously further aft, and starting to flatten out. Yet the FPB 97 is moving at a speed length ratio of only 1.27, i.e what is considered displacement speed. This is an indicator of an interesting future when we are allowed to go to wide open throttle on the engines. 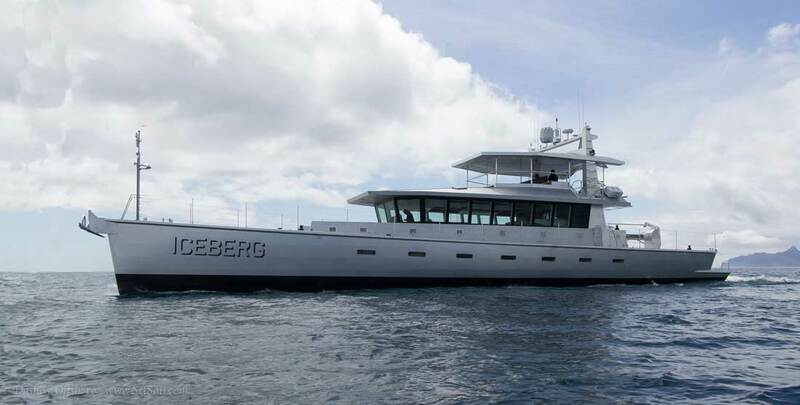 In case you are new to the scene, this 110-foot yacht is being propelled by a pair of 235HP John Deere 6068 SFM 50s. 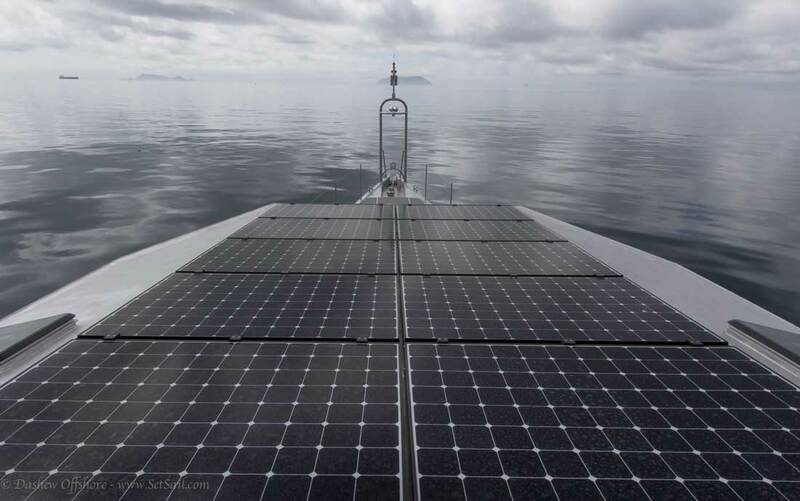 Sea trials include testing systems at length, and the power for this is mainly being supplied by the solar array, a total of 20 of these high output panels. 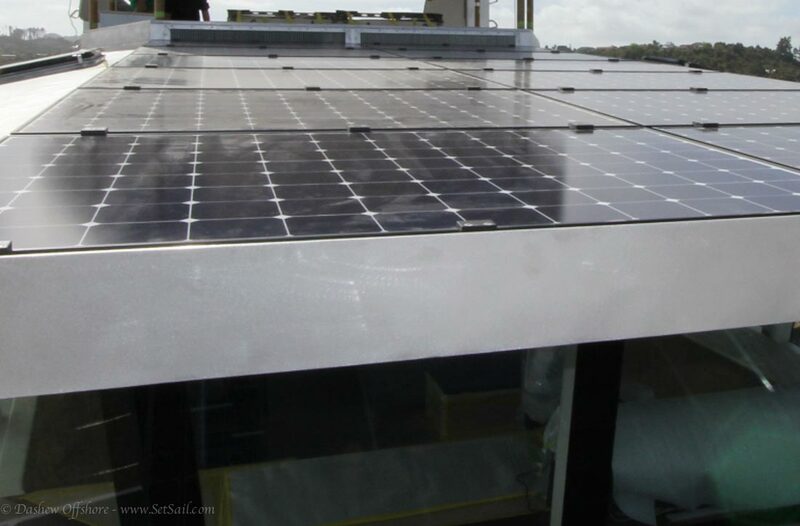 This array is capable of delivering over 6000 watts of power, and is doing such a good job that the batteries are staying topped up without difficulty. The passive vent system, large inlets in the forward side of the Matrix deck coaming and under the great room roof overhang, are doing their job of keeping the interior cool. Speaking of icebergs, it will be a while before the first FPB 97 gets to visit big ice, so we transported her to Greenland’s Disco Bay. 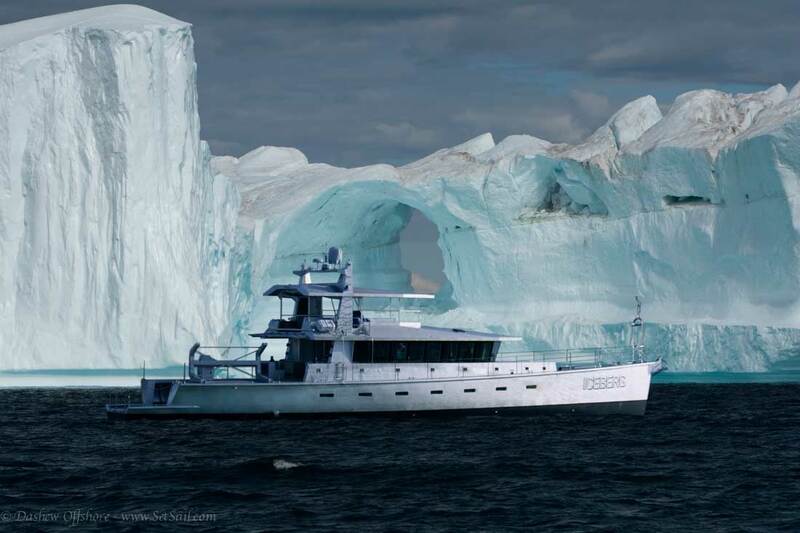 If you would like to enjoy Greenland’s charms click here for a short video taken aboard the FPB prototype Wind Horse a few years back. We should add that all of this is being closely monitored by FPB 78 owners. The FPB 78 is the next step in hydrostatic logic and systems. For a review of the FPB design concept click here. A complete recap of all FPB 97 posts is here. An introduction to the FPB 97 is here. This entry was posted on Tuesday, November 25th, 2014 at 8:34 am and is filed under Dashew Logs, The Logs, three, Wicked FPB 97. Both comments and pings are currently closed. The wake looks like the outline of a whale’s tail. Funny, I just said exactly that on Facebook! You transported her to Greenland!? Wow!! I knew there was technology in that thing you weren’t telling us about. She looks right at home next to the ice. I hope the new owners plan to really take her up there. For her current displacement a bit stern down and bow up is actually very efficient. Prop immersion and thrust vectors benefit and the longitudinal volume distribution is within optimum needed paraemters. Just how wicked is the FPB 97….the world wonders….